The day started with the future stars of youth basketball playing in their club tournament for the U10 age group. The youngsters then accompanied the youth international players during the pre-match ceremonies later in the evening. The first match of the evening was between Poland and Germany. The first quarter was a shooting festival with Poland coming out on top (30-20). The Polish coach was not very happy with his team's performance and gave his players some hard words. Poland closed down the offensive threat from Germany during the second quarter and went into the interval leading (53-33). Poland's dominance ended the game as a contest by the end of the third quarter (75-45). Both coaches rotated players during the final quarter as the game fizzled out. France took a while to get going against Bulgaria and allowed their guests to open the scoring. 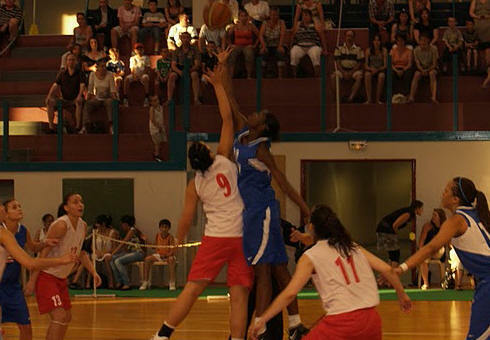 However the lead did not last long: Alexia Plagnard fired in a shot from beyond the arc and France was on their way. France took control of the game slowly and led (18-9) by the end of the first quarter. The Bulgarians were more aggressive during the second quarter but were penalised by the officials and fell further behind (19-35). After the break France scored 12 unanswered points to lead (49-22) with 26 minutes played. Alain Jardel, the coach from France, then used the remaining 14 minutes to turn his bench and try out things. France were never in trouble and won comfortably (66-35) with all 12 players scoring. Mirena Dencheva for Bulgaria and Plagnard from France led the scoring with 12 points each.